We live in a time in which shoppers can have anything—literally anything—shipped to their front door with a click of a button. From the latest paleo-friendly snack to groceries for the entire week to a unicorn horn designed for your cat, convenience is king in this modern retail era. While online food sales still represent a small slice of total food sales, they’re rapidly growing. Slinging good food alone isn’t going to help your store weather the digital retail storm; you must do everything you can to make your store a destination, a place where people want to stick around. When conducting our research for Natural Foods Merchandiser’s Market Overview, we interviewed hundreds of natural products retailers to learn more about their business in this challenging retail environment. What categories grew? Which declined? How did retailers differentiate their store from the competition around the block or across the web? We received hundreds of responses. But like Crawford suggests, the retailers that seemed to have the most fiercely loyal shoppers were the ones that crafted their natural products store to be a place that people love. Their stores are places where shoppers like to congregate. Places where people gather to learn new skills, meet new people and find new products, new foods, new services and new ways of living that foster health and wellness. Many factors contribute to retail success, but thoughtful design—which includes store layout, lighting, merchandising and having tight control of consumer experience—matters most to create a space where shoppers feel at home and yet experience a sense of discovery. We tapped the minds of top retail, design and branding experts to better understand how design can improve your store’s atmosphere, community, customer experience and, ultimately, sales. Zak Normandin is a branding maven. A former U.S. Marine engineer, he is the co-founder and CEO of Dirty Lemon, a hip functional beverage company that features lemony water infused with ingredients such as activated charcoal, collagen, matcha and more. Dirty Lemon has a unique, direct-to-consumer distribution model in which consumers bypass traditional retail stores entirely by texting the company to order boxes of the beverage. David Sheldon, vice president of client engagement at the architecture firm Retail Design Collaborative (RDC), agrees. Making sure shoppers had a memorable time was a primary focus when designing Erewhon Organic Grocer and Café’s new store in Santa Monica, California—the retailer’s fourth location. “Our role was about ensuring the guest experience was a positive one. From the moment people parked to the shopping experience to eating the fresh prepared food, cultivating guest experience was paramount,” Sheldon says. The Erewhon architects paid meticulous attention to making the store into a destination—not just a place to buy food—by building an outdoor patio space and improving the “indoor-outdoor connection,” meaning the outdoor areas and the indoor space seem to blend together. For example, when shoppers first approach the store, they see a massive overhang protecting an outdoor patio. Multilevel concrete planters surround the eating area to create a cozy oasis and protect diners from street noise and general sidewalk bustle. Equally important to improving the setting is making sure enough staff is present on the floor to answer questions, guide shoppers to find new products and make checkout a swift, stress-free process. Consumers want to peruse your store’s unique offerings, sip on an organic fresh juice, taste-test a new nut-based vegan cheese and enjoy a pleasing, inspiring atmosphere. They don’t want to wait in line. If a total store remodel isn’t in the budget, upgrade merchandising tactics to better guide shoppers toward unique products and deals that ignite imagination and excitement. 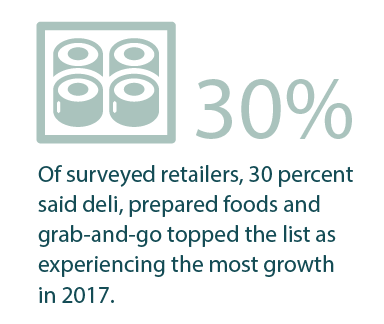 According to a 2016 study published in the European Journal of Economics and Business Studies, food retailing is particularly difficult because many customers regard grocery shopping as a task, and not necessarily an experience. Store layout and specific product presentation is one way to pique shopper interest. “However, retailers should keep in mind that the goal is to keep customers intrigued and entertained in the store as long as possible, not just [in the store] as long as possible,” report the study authors. Providing easy egress points—such as fast checkout lanes or an alternative exit to your forced-path layout is a smart, simple solution to keep consumers happy. At the store, he’s adamant that retailers should keep the merchandising of certain product—such as a great-tasting Italian cheese—simple and clean. Pointed messaging and signage should reinforce the initial reasons why you stocked the product in the first place. Is the product from an area that has a unique terroir? Is it from a family farm or producer? Tell these stories to help consumers glean a greater product understanding. Vialpando recommends keeping pyramid displays to one to two items instead of five to six to minimize noise around the featured product. Too many items displayed makes it difficult for shoppers to understand what the item is that you actually want to showcase. Clearly display the price of the product to spark customers to make that impulse purchase—research shows that upwards of 68 percent of buying decisions are unplanned. Take advantage of those spur-of-the-moment purchases. Experts agree that cross-merchandising one product across several not-so-obvious categories is an effective way to drive sales, too. If you’re featuring a new olive oil, place it in produce next to the salad greens. If you’re introducing a new granola, in addition to featuring it in the cereal aisle, place it in the milk or yogurt department, too, suggests Vialpando. Making a seamless connection between new and existing products makes it easier for consumers to incorporate featured items into their staple meals. Wherever possible, incorporate natural light into your store to best highlight produce and other prepared foods, says Sheldon. While working on Erewhon’s Santa Monica store, the architects cut out large sections of the ceiling to build out skylights. If you don’t have access to natural light in your store, choose warm, soft lights—such as track lighting—to craft a pleasant, high-end atmosphere. Stay away from 2-by-4 warehouse lights that cast unappetizing shadows on food. When designing grocery store interiors, Phillips prefers to use 3,500K bulbs, which have a warm, yellow tone, in the produce, grocery, deli and grab-and-go areas. For refrigerated and frozen areas, he recommends using 4,000K bulbs for brighter, more blue light because these cases are often located in darker aisles. When in doubt, request different samples from your bulb supplier and experiment with different lighting in your existing fixtures across the store to discern which bulbs brighten your food the best—use trial and error to find your best lighting system. Design is a powerful tool that can help you better serve the needs of your customers. Wield it well.